How do I register on the 4Real Message Board? Click on the �Register� icon at the top right hand corner of any page. Fill out and submit the required information. You will be sent an activation email. Please DO NOT attempt to log in to the message board until AFTER complying with the directions in the activation email or the activation process will fail. If you have problems registering, email: forums at 4real dot thenetsmith dot com. It is possible to italicize, bold, underline, indent, create bulleted lists, change font color and size, and change fonts. The icons and dropdown boxes used for these functions are located across the top of the Post Reply window. How do I quote someone�s post in my message? Before beginning your reply, go to the message that you want to quote and hit the �quote� icon at the top right hand corner of that message. The entire message will appear between �QUOTE� brackets in your Post Reply window. Delete the part of the message that you don�t want to quote, making sure that you don�t delete the �[ QUOTE=username ]� AND �[ /QUOTE ]�. Again, make sure to remove the spaces that we have put inside the brackets. How do I add links to my post? To add a link to your post, click on the 4th button from the left in the Post Reply area (looks like a globe with a chain link on it). In the window that appears, type the "link text" that you want highlighted in your post (ie. the text that you want blue and underlined) and hit OK. In the next window that appears, type in the address for the link and hit OK. NOTE: You must include the �http://� portion of the address, not just the �www� part for the link to work properly. 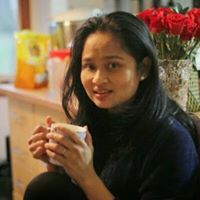 How do I edit or delete my post or topic name? There is a row of icons at the bottom of each POST. You can edit your post after posting by clicking on the �edit� icon in this row. Your post will appear in a �Post Reply� window. After making the desired changes to the post or the topic name, hit the �Update Post� icon. This is a great feature for correcting typos. You may delete your own posts as long as no one has replied yet. Once your post is not the last post in the thread, it may not be deleted. 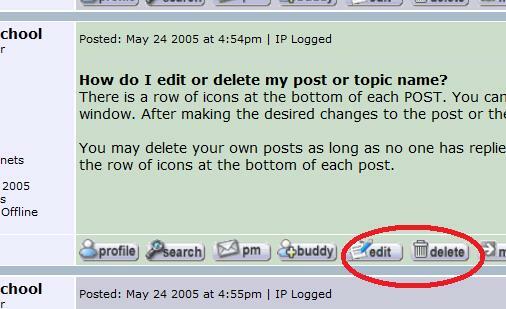 The �delete� icon is located in the row of icons at the bottom of each post. 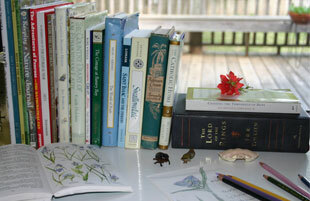 How do I post a picture or a file? If the picture that you want to post is already located on the internet somewhere, you can add a link to the image by clicking on the icon that looks like a tree (in the post reply window) and typing in the internet address of the picture. If the image/file is not already on the internet somewhere but is instead on your computer at home, it must be uploaded to the server. 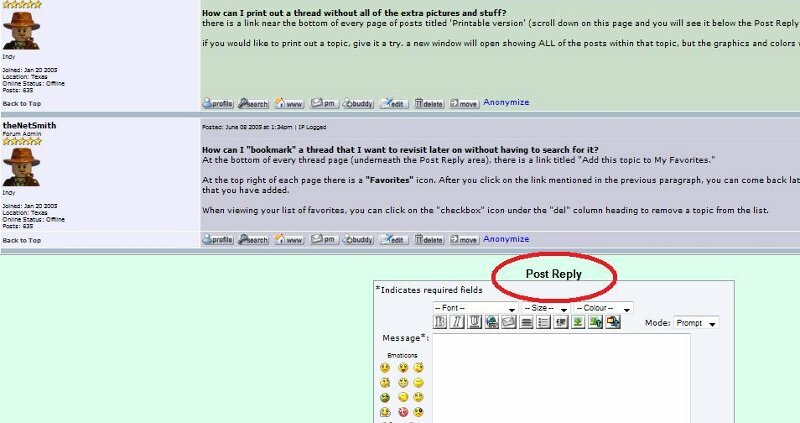 Only forum moderators may upload files and pictures. Please contact a moderator (through email or private messenger). What is private messenger and how do I use it? 1. Click on the �pm� icon at the bottom of a post made by the member you want to PM. 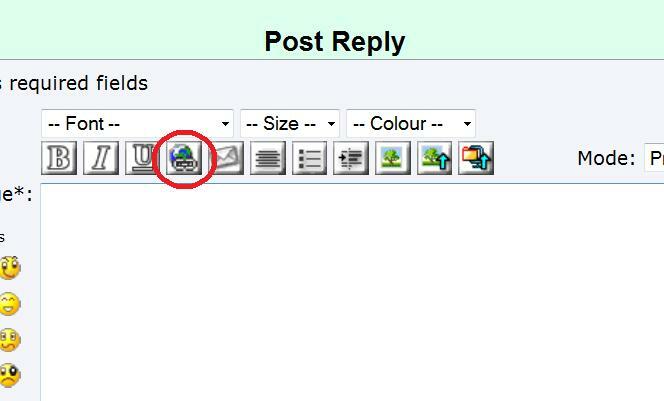 Type your message in the post window that appears and hit the �Post Message� icon. Your message will be sent to that member. 2. Click on the �Private Messenger� icon at the top right hand corner of any page. Click on the �new msg� icon near the top right of the page. You must enter the member�s username in the correct field, then type your message and hit the �Post Message� icon. If someone has sent you a private message, a dialog box will appear when you access the board. Clicking on the OK button in the dialog box will take you to your private messenger inbox. Your inbox holds 100 private messages at a time. Once your limit is reached, you will not receive more private messages. A person trying to send you a message will NOT be notified that your inbox is full, and you won�t be notified either! You must monitor your own inbox and delete messages as necessary. How do I add a little picture under my username? The little picture that appears under your username is called an avatar. To add an avatar, click on the Settings icon at the top right hand corner of any board page. Select Edit Profile. Scroll down to the Select Avatar section of the page. You can choose from the available list of avatars or upload your own picture. If you need help, contact the Forum Administrator (theNetSmith). I don't think the topic watch feature is working. I am not receiving e-mail every time someone posts on a thread that I am watching. For complicated, technical reasons that we can't quite put our finger on, the web server is often unable to send e-mail to yahoo.com e-mail addresses. If you have registered with a yahoo.com e-mail address, you will likely NOT receive every e-mail that the system attempts to send you. If you think this might be the case, you can edit your profile to change your e-mail address at any time. How do I use emoticons? Emoticons are the cute "faces" that appear from time to time in posts. A small selection is included at the left of the Post Reply window. In order to add an emoticon to your post, place the cursor in the correct location in your reply window and click on the emoticon. A larger variety of emoticons along with definitions is available by clicking on "more..." to the left of the reply window. Does the board have a spell-checker? No. But you can type your post in Word or some similar program and then cut and paste into a Post Reply window if spelling is really important. Is there a way, when I first log on, to see all the posts that have been posted since I was last on the board? Yes. After you log in, click on "Active Topics" at the top of the page. You will be taken to a page that shows all threads that have been active since your last login. You will also find a drop-down listbox on that page that allows you to change the timeframe to see all active threads in the past 15 min, 30 min, hour, 2 hours, etc. How can I quickly get to the most recent post in a thread without clicking the Next button again and again? On the homepage where all of the forums are listed, take note of the information presented in the "Last Post" column. First, you see the date and time, then under that you get the name of the user who made the last post. Next to the username, you will see a grey square image with a white arrow on it. Clicking on that arrow image will take you directly to that last post! How can I print out a thread without all of the extra pictures and stuff? there is a link near the bottom of every page of posts titled 'Printable version' (scroll down on this page and you will see it below the Post Reply area). if you would like to print out a topic, give it a try. a new window will open showing ALL of the posts within that topic, but the graphics and colors will be removed. How can I "bookmark" a thread that I want to revisit later on without having to search for it? At the bottom of every thread page (underneath the Post Reply area), there is a link titled "Add this topic to My Favorites." At the top right of each page there is a "Favorites" icon. After you click on the link mentioned in the previous paragraph, you can come back later and click on the Favorites icon at the top to see a list of the threads that you have added. When viewing your list of favorites, you can click on the "checkbox" icon under the "del" column heading to remove a topic from the list. Help, I can't edit my profile! You can edit your profile once you've got 10 posts to your name. So post away.